The Victoria Accordion Club meets the first sunday of every month at the German Club in town -Edelweiss Club. I've enjoyed many meetings, you pay $3 and get tea and donuts. Oh! And you can sit and hear some amazing accordionists play and blow your mind. I've played there as well, and besides this little guy that is about 8 years old, I'm the next youngest person there. 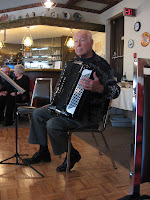 Some of the amazing accordionists there include the wonderful Irv Lang, who taught in town for many years, and is the leader of the Accordion Band. There is also Marc Wald, a very entertaining man full of stories. He used to play on the Tommy Hunter show back in the day.